the letters formed with lamps called mahya,usua-lly done in Ramadan,to encourage people while fasting,in this sentence it s written "Fasting keep us"
An amazing photo, the dark foreground helps us to concentrate on the main focus of the picture. Thanks for posting this. 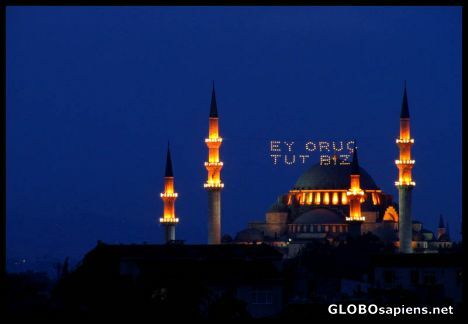 Good shot, I like it because the mosque is in darkness and the the letters and top of the minarets are lighted. Burak, an excellent 5* night shot and well described too. Thanks! This is an extraordinaby picture in an extraordinary beautiful town like Istanbul. How lucky you are to live in that lovely city.